Plymouth-based Bombardier Transportation undertook a KTP project to develop and design the next generation train detection and signalling system. 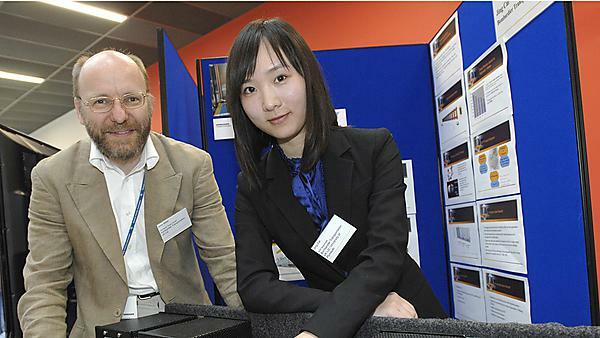 Electronics and robotics research - Jing Cai and Andy Millar, Engineering Design Manager, Bombardier Transportation. Bombardier is a world leader in the field of developing, engineering and installing advanced rail control and signalling systems and part of Bombardier Transportation, a leader in the global rail sector with operations in more than 35 countries. One of the products that have been designed and manufactured at Bombardier Plymouth is the EB/Track 400, a coded train detection system which was launched at the InfraRail exhibition at the NEC in March 2008. The Bombardier Plymouth team realised that they lacked the necessary innovative coding algorithms expertise required to further develop the product, and turned to University of Plymouth's academic experts to help them address this problem. The work carried out to develop the new EB/Track 400 coded track circuit system, with support from University experts and KTP Associate Dr Jing Cai, has resulted in Bombardier being approached by Network Rail who want to adopt the system for use in the UK. This extraordinary and unprecedented success within the industry makes Bombardier the only UK Company to have coded track circuit technology being used by Network Rail. This KTP project has made a substantial impact at the Plymouth site, most significantly by raising its profile and ensuring its long-term survival. More importantly, the KTP has helped secure sixty jobs, leading to the retention of vital skills for research, development and manufacturing for the South West region and the UK. The relationship between the company and the University continues to flourish with the securing of funding for a second KTP project. Visit the Bombardier Transportation website. Contact the Enterprise Solutions Service on +44 800 052 5600 or by email at enterprisesolutions@plymouth.ac.uk. We look far ahead to see and shape the future of mobility.